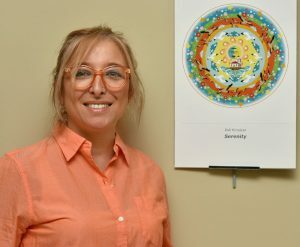 SUNY Oswego's Asli Kinsizer, a graduate student in graphic design and native of Turkey, looks forward to members of the community helping fill in a larger version of her mandala design with colored sand in Penfield Library, a project inspired by the April 8 to 12 visit of monks from Drepung Loseling monastery to create their own mandala. OSWEGO — Asli Kinsizer first made a trip from her native Turkey to SUNY Oswego as a mentor to high school students competing in the GENIUS Olympiad. Less than four years later, she is a graduate student at the college, considers Oswego home and is excitedly awaiting public participation in finishing her mandala in Penfield Library. SUNY Oswego’s Asli Kinsizer, a graduate student in graphic design and native of Turkey, looks forward to members of the community helping fill in a larger version of her mandala design with colored sand in Penfield Library, a project inspired by the April 8 to 12 visit of monks from Drepung Loseling monastery to create their own mandala. 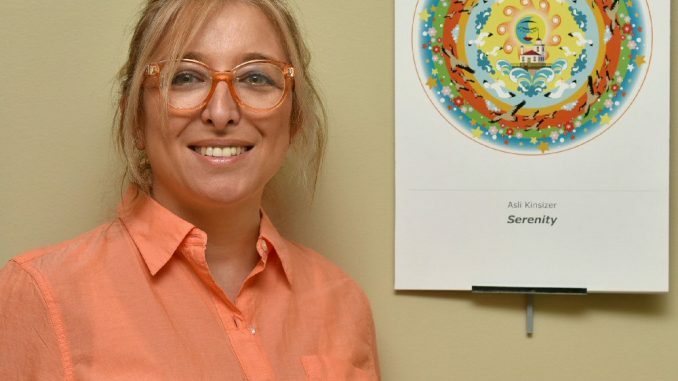 An art teacher in Istanbul for 20 years, she moved here with her daughter — now a 9th-grader at Oswego High School — two years ago and launched into work on her second master’s degree, in graphic arts. Last semester, Kinsizer was among students in art faculty member Amy Bartell’s “Advanced Illustration” course. Each designed a mandala to help herald the April 8 to 12 visit of the Drepung Loseling monks for “The Mystical Arts of Tibet” on campus, presented by Artswego. “Her mandala is the image that the community will be invited to come in and create, filling in Asli’s design with colored sand,” Bartell said. All of the students’ designs are on display in the library’s main lobby. The Buddhist monks will work on their own mandala — an intricate sand painting of concentric circles layered with symbolism — in Penfield, while nearby SUNY Oswego students trained by the monks will guide visitors in using the ancient narrow funnel called the chakpur to fill in Kinsizer’s design. Hours for the mandala construction projects are 10 a.m. to 6 p.m. daily; events surrounding the monks’ work are free and open to the public. Bartell said the creative foray of her class into mandala design was fascinating. Her students needed to learn to work “in a more generous way. They needed to decide what they stood for and what makes them happy,” she said. Kinsizer’s choice in mandala design reflects her childhood close to the Mediterranean Sea. “Here, I saw the beautiful, beautiful lake (Ontario). I saw the pastel colors. I fell in love,” she said. Meanwhile, as Kinsizer anticipates graduation in May, she is preparing for her portfolio exhibition in the semester-ending Master of Arts Spring Exhibition and working with schoolchildren in the art department’s At the Art Studio program. For more information on the Drepung Loseling monks’ residency, visit oswego.edu/artswego. The art department’s website, oswego.edu/arts, provides information on the many options for both undergraduate and graduate programs.